Your next podcast listening session could be interrupted by dynamically placed, constantly refreshed and targeted content —read advertisements —served up by iAd, if Apple deploys technology described in patent application published Thursday. Titled "Technologies for inserting dynamic content into podcast episodes" and published by the U.S. Patent and Trademark Office, Apple's invention is quite simply an automated advertising system for podcasters. The key difference for advertisers used to live reads or spots served up by content owners is potential access to Apple's iAd platform, which provides analytics and backend support for comprehensive user targeting. 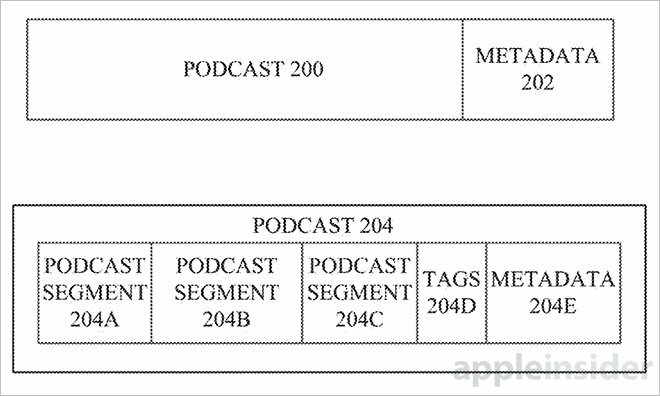 Using tools described in today's filing, content creators or ad services would be able to mark one or more insertion points within a given podcast episode, perhaps at a regularly scheduled break time, with a metadata tag. A podcast app tracks playback on a client device and when a tag is reached pauses the episode, dynamically inserts a targeted ad and resumes programming automatically. Importantly, the ad delivery component is able to feed ads to a client device while a podcast is playing, downloading or streaming. Further, ad inventory can be cached in a local database for varied, and therefore more effective, placement. In another embodiment, the system regularly checks in with a central server to download new ad content in the background, thereby ensuring a consistently fresh and working database. The ad targeting mechanism is a basic description of Apple's iAd platform, which taps into iTunes account info, anonymized user metrics, device type, rough location, time and more. Deeper integration involves user behavior and demographics targeting, though being a vocal opponent of customer data commoditization, Apple is unlikely to employ such techniques. Also mentioned are powerful analytics tools that monitor ad playcounts and consumption rates for multiple users over multiple devices. This feedback method provides vital information to a primary or secondary ad service and could in some cases determine payout to a podcaster. As for the ads themselves, Apple notes a variety of formats including audio, video and interactive content. It is not known if or when Apple plans to roll out such capabilities, though its iAd business got a shot in the arm earlier this year with the activation of automated ad buying and a consumer targeting tool called Customer Match. Apple's iAd for podcasts patent application was first filed for in January 2014 and credits James O. Boggs, Ryan Griggs and Sam Gharabally as its inventors.